One of the questions that is most often asked of me is: can I make a living online? Can I make a career out of blogging? The answer is always, of course, if you are willing to put in the time. From my experience, you can break down the people that ask "can I make money online?" into two categories. You have the people that are just looking for an extremely easy way of making money that doesn't require much work, and you have the people that are intrigued about the idea of connecting with people all over the planet, and get their written words in fact of potentially millions of people. I would say that the former group makes up about 95%, and then you are left with the 5% that are actually intrigued by the Internet and all of its money-making possibilities. Which one are you? Write content, contact potential link partners, monitor your comments for spam, monitor your advertising stats, answer emails, possibly organize guest writers on your blog, open new sites, etc. etc. This might not sound like much, but consider that if you plan to run an active blog, you are probably going to be spending 4-5 hours per day just on the creation of your content. When you add in the other responsibilities that you will have running a blog, you are looking at at least an 8 hour day, probably expanding into a 12 hour day if you plan on being really successful. However, those 12 hours will be a blast. There is nothing better than watching a blog grow, and watching the advertising dollars that you make from the blog grow. As more and more advertising dollars are spent online, there will be more and more opportunities for people to monetize a blog. And because of that, there will be plenty of opportunities to get "hired" on to work for a blog. Maybe you don't have the know-how to start your own blog, but you are an expert in finance? You can get hired on to write for another blog, and work on a contract basis that way, making a salary and a share of the advertising dollars. For someone who doesn't plan on leaving their full-time job, this can be a great way to enter the world of blogging but not have to worry about spending 8 hours a day maintaining the blog. Just write the content and let someone else deal with the ins and outs of running the blog. The NY Times had an interesting article this weekend on blogging jobs. As I said, as more advertising dollars are spent online, there will be more opportunities to make money with a blog. A blog is a highly personal way for advertisers to connect with readers, and a very cost effective way of spending advertising dollars. I believe that any advertising spending estimates online are going to be conservative, and I believe that Internet advertising will be far and away the most used method of advertising over the next couple of years. Online advertising offers so much in the way of customization and cost tracking; in my opinion, it is just far and away a better way to advertise. If you are a shoe company launching a new basketball shoe and had a million dollars in your advertising budget, would you rather spend that million dollars on a bunch of radio and TV ads, or stretch that budget and use Adwords, Overture and Adcenter to create a custom campaign, explicitly targeting the market that you want, advertising only on the web sites that you want to advertise on? For me, you are going to get much more bang for your buck with online spending, and companies are quickly realizing that. Again, look at the success of the "300" online advertising campaign, and you will see where we are headed. 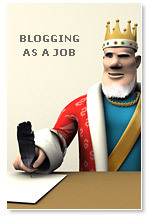 In closing, blogging as a job is extremely possible, but only if you treat it as a job and not just a hobby. If you are prepared to put in the hours and if you are prepared to treat it as a serious venture, then the sky's the limit. Good luck.